This information is provided courtesy of Nagella AL-Balushi, a graduate student who is interested in promoting a bill that improves health professional workforce distribution via a loan repayment program when practitioners work in underserved areas. I am a graduate OT student seeking opinions, feedback and thoughts about a legislative bill that would potentially have a great impact on the field of OT if passed​! This information is provided courtesy of Tori Persons, a graduate student who is interested in legislation that would help alleviate the burden of out of pocket costs for people receiving occupational therapy services. 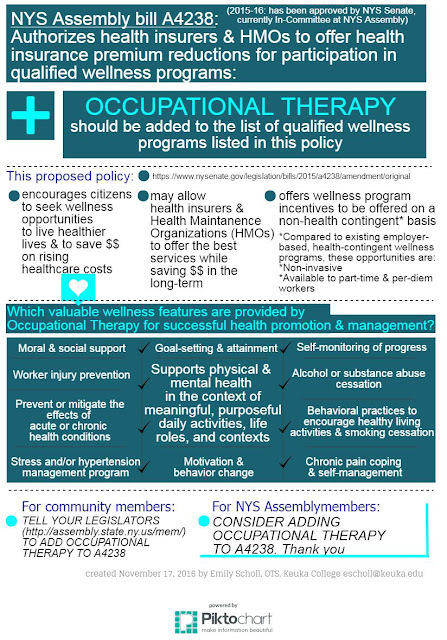 "Existing laws in New York have stated that health plans must cover occupational therapy services. However, the insurance companies have found loopholes and bypassed these laws. They did this by shifting the majority of the costs for OT services onto the patients by increasing the cost of copayments. This week has been identified as the #OTWeekOfAction by the American Occupational Therapy Association. They are encouraging member actions on a number of policy initiatives; however, as noted in the previous blog post, it is important for occupational therapists to independently assess the nature of these proposals before blindly writing letters of support to Congress. Individuals may learn that they agree with the positions of the professional association or they may learn that they disagree. 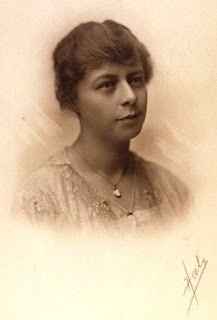 The original book "The Counterpane Fairy" was written and illustrated by Katharine Pyle in 1898. It is a fanciful story of a fairy who visits children in their beds as long as they do not cry. The fairy brings some comfort to these children and has the ability to magically transport them away from their circumstances if they focus on one of the squares of their counterpanes (bedspreads). Occupational therapists may not be aware of how this story is relevant to the profession's history. This post will conclude the exploration of 'The Case of Lena' and explain how Pyle's story influenced George Barton. Continued from Part I - Read here. This exploration of some of Barton's writing outside of professional journals is offered for additional context to assist readers in understanding his concerns and passions that related to the occupational therapy profession. Now what I don't understand is this. It was too bad that Lena couldn't take that elegant job in the 5&10 and I guess the manager was sorry too because they say it's hard to get good girls like Lena and her father would be glad of her help I'll say so. Social media has been one long party this week in the occupational therapy world with therapists and membership associations popping champagne corks over the recent article that appeared in Medical Care Research and Review entitled "Higher hospital spending on occupational therapy is associated with lower readmission rates." Click here for the abstract, but please go read the whole thing. Once you get beyond the abstract you get straight to the nut of the problem where the authors admit right in the introduction that "the relationship between hospital spending and quality...is poorly understood in the literature..."
For background reading on this precise issue and concerns about how people are defining 'quality' in health care outcomes click here and here . History provides context for understanding. We are so far removed from the daily life struggles of 100 years ago and our own experiences are so very different that it is difficult for us to develop a clear understanding of why events unfolded the way that they did. Occupational therapy is a health related profession that was born from the crucible of American society and culture at the turn of the 20th century. As such, events from those times greatly influenced the thinking of our primary founders. George Edward Barton lived in Clifton Springs in Ontario County on the street behind the Clifton Springs Sanitarium (private) which had a capacity of 400 patients. The Ontario County Sanitorium for Consumptives (Oak Mount) was the public facility, previously known as the County 'Poor House' in nearby East Bloomfield and had a capacity of around 40 patients. Today's Wall Street Journal includes the standard article in its Life/Health section on Sensory Processing Disorder that we are all accustomed to seeing published every six months or so. How to damage OTA practice and diminish the OT profession in three easy steps. 1. Promote mission and scope creep of community colleges without thoughtful vetting of the consequences. 2. Purposely ignore the impact of minimum wage increases on the nonprofit human services sector. 3. Ignore the feedback of a professional membership that strongly opposes increasing OTA education to the bachelor's level. It is very important to click the embedded links (above) to fully understand the scope of this issue. What is left to do? Get involved and demand more thoughtful decision making from the OT leadership. Specialization is an unfortunate by-product of expansive knowledge. It is challenging to remain abreast of developments in multiple fields and in the busy lives of modern day humans people come to rely on the comprehensive thinking of 'others' while they busy themselves with their specialized thinking. Few stop to consider whether or not those 'others' to whom great power is ceded for their comprehensive thinking are actually up to the task. Or, if they are up to the task, who is doing the checking to make sure that the use of said power is being delegated for the broader good?